Discussion in 'UFC Discussion' started by FarCry, Jul 28, 2016. As the title states, where is Lyoto? I know he turned himself in for taking something but was he ever suspended or what? I don't recall ever hearing anything about a punishment besides being off the card on Fox. Who is this, Lyoto Machida? shaffmeister, NightwingBJJ, JohnyBrabo and 1 other person like this. Drinking shots of Lesnar and Jones' piss. Dogo1, Kwic, NightwingBJJ and 3 others like this. Is this where we speculate that he has "disappeared", is "in hiding", or "has retired without announcing it", or is that kind of talk reserved just for Ronda? No clue. Hope to see him back soon. Tony Ferguson and JohnyBrabo like this. I have no idea haven't heard anything recently. I hope he comes back for few more fights before retirement. He is still on a provisional suspension from USADA. Pacemaker Joe and NightwingBJJ like this. I heard 2 years but am hoping there will be some leeway and it will be reduced. Where's his brother? Wasn't he supposed to debut at Bellator? Seems to be taking forever on an official announcement. Any clue when we might hear something definitive? 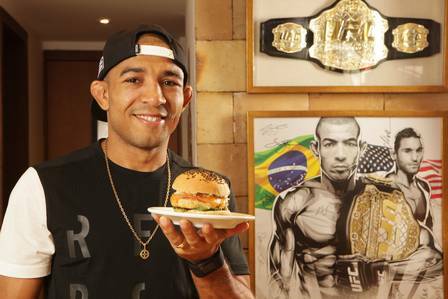 Lyoto's working at Aldo's burger joint. You don't see or hear from him because Jose never gives him any days off. Gordon Ramsay is looking to pay a visit over there on the next Kitchen Nightmares episode. shaffmeister, JohnyBrabo, crxer and 1 other person like this. It appears the Machida Era has ended. Sorry, bad taste, I know. I'm honestly still surprised at how things worked out. I REALLY thought after Rashad that he was going to rule 205 for a while, and to have that title last one highly contested fight against Rua, and then to never have it again, drop to 185 and do "so-so", then self exile for PED use....nuts. No hate for the man, he was a champ, just thought he'd do better, longer. Your av bother! I just want to like your posts based on that alone! Thanks my man, much love. She's a Georgia Peach for sure. Would like to see him fight Bisping for the title. I think Machida still has enough left to whoop Bisping. I don't see Machida becoming champ again if Weidman or Rockhold gets the belt back.